C# is an ideal language to develop a spellchecker. Its is fast, stable, strongly typed and allows the complex data-structures required to perform advanced spell-checking tasks such as fuzzy logic and phonetic scoring. SpellTextBox is just like a normal TextBox control - except that spellchecking “as-you-type” is implemented for all major browsers since IE5. 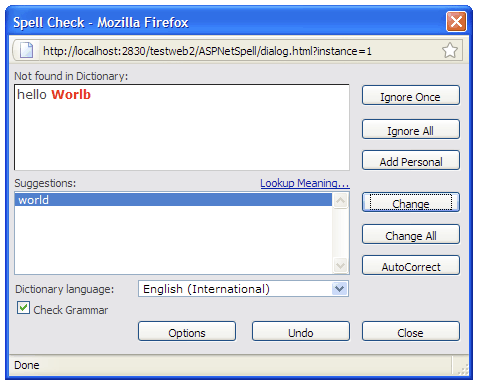 In addition, the spellchecking dictionaries and behavior can be modified by the developer using C#, ASPX or MVC code. SpellAutomator automatically adds the SpellTextBox to any or all TextAreas and Inputs on an HTML page without requirement to modify the original code. 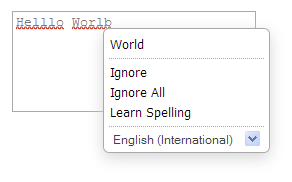 It is ideal for adding spellchecking as an “upgrade” to a website or intranet. The button is added and set up on your page using pure c# code. 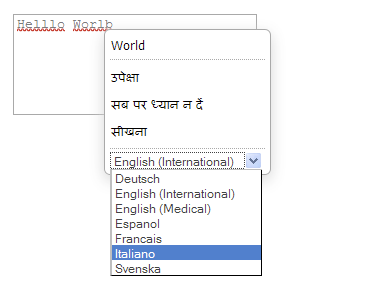 SpellButton is a button, link or image that when clicked - opens a MS-Word style spellchecking dialog window - including grammar checking! This spellchecking dialog is very robust - and can be used to spellcheck any or many textarea, field, dom element - or even an entire page. The button can be added to your page and modified using pure C#. ASPNetSpell can be used by C# developrers to make custom desktoop and server spellchecker apps and services using its robust ASPNetSpell.SpellChecker Class. Download and unzip AspNetSpell to a convenient location on your hard disk. Drag the SpellAutomator control onto you page - and set the FieldToSpellCheck property to the id (or comma separated list of ids) to the field you want to add spellchecking to. 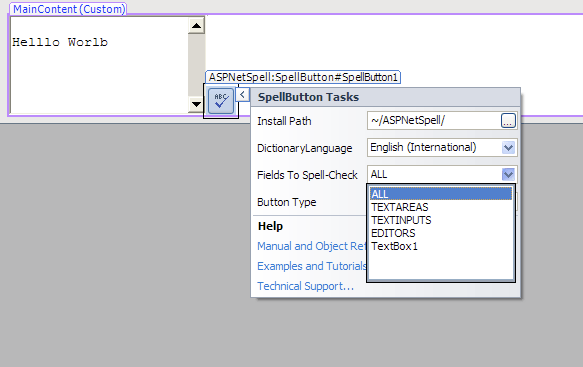 To select the field(s) that AspNetSpell will spell check, change the FieldsToSpellCheck property. nanospell for ASP.Net is an independent spellchecking plugin project. Our team members at Iron Software are also currently developing an advanced C# based OCR technology and C# HTML to PDF libraries for .Net developers. This software project is in active development and is still supported by the original developers after 10 years of product evolution.